Habit: [Perennial herb] shrub, tree, generally erect, often thorny. Leaf: simple, generally alternate, often clustered on short-shoots; stipules generally present, occasionally modified into spines; generally petioled; blade pinnate-veined or 1--5-ribbed from base. Inflorescence: cyme, panicle, umbel, or flowers 1 or clustered in axils or on short-shoots. Flower: generally bisexual, radial; hypanthium subtending, surrounding, or partly fused to ovary; sepals 4--5; petals 0, 4--5, generally clawed; stamens 0, 4--5, alternate sepals, attached to hypanthium top, each generally fitting into a petal concavity; disk (0 or) between stamens, ovary, thin to fleshy, entire or lobed, free from ovary, adherent or fused to hypanthium; ovary superior or +- inferior, chambers 2--4, 1--2-ovuled, style 1, stigma entire or 2--3-lobed. Fruit: capsule, drupe. Genera In Family: 50--52 genera, 950 species: especially tropics, subtropics some cultivated (Ceanothus; Frangula; Rhamnus; Ziziphus). Scientific Editor: Steve Boyd, Thomas J. Rosatti. Habit: Shrub, tree-like or not, generally erect or mat- to mound-like. Stem: branches generally arranged like leaves; twigs thorn-like or not, generally not angled. Leaf: alternate or opposite, some clustered on short-shoots or not, deciduous or evergreen; stipules scale-like, thin, deciduous, or knob-like, corky, thick, base persistent; blade flat or wavy, tip generally acute to obtuse, margin thick (i.e., thicker than adjacent blade) or not, rolled under or not, wavy or not, entire or gland- or sharp-toothed, glands generally dark, teeth pale, alternate blade 1--3-ribbed from base, generally thin, opposite blade 1-ribbed from base, thick, firm. Inflorescence: umbel-, raceme-, or panicle-like aggregations of few-flowered clusters, axillary or terminal; pedicels white to deep blue or pink. Flower: conspicuous, generally < 5 mm; hypanthium surrounding fleshy disk below ovary base, in fruit thick, not splitting; sepals generally 5, lance-deltate, incurved, colored like petals, persistent; petals generally 5, blade hood-like, white to deep blue or pink; stamens generally 5, opposite petals; ovary 1/2-inferior, 3-lobed, chambers 3, each 1-ovuled, styles 3. 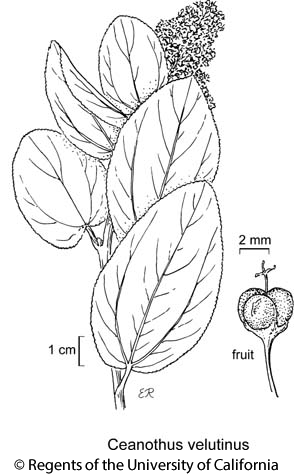 Fruit: capsule, +- spheric, generally +- 3-lobed, generally smooth, 3-ridged or not, horned or not. Seed: 3, 2--5 mm. Species In Genus: +- 55 species: North America. Etymology: (Greek: thorny pl) Note: Hybrids possibly common (named hybrids not recognized here), discussed in Fross & Wilken; possible hybrid forms do not key easily. Reference: Fross & Wilken 2006 Ceanothus. Timber Press; Burge et al. 2015 Syst Bot 40:950--961. Habit: Plant open, < 6 m. Stem: erect; twigs flexible, not thorn-like, green to red-brown. Leaf: alternate, evergreen, aromatic; stipules scale-like; petiole 9--32 mm; blade 33--75 mm, 13--55 mm wide, widely elliptic to ovate, leathery, adaxially shiny green, glabrous, +- sticky, abaxially glabrous to +- puberulent, tip obtuse to rounded, margin minutely gland-toothed, teeth 90--150+. Inflorescence: panicle-like, 3--8 cm. Flower: white. Fruit: 3--4.5 mm wide, brown, sticky, wrinkled or not; horns 0. Citation for this treatment: Dieter H. Wilken & Dylan O. Burge 2016, Ceanothus velutinus, in Jepson Flora Project (eds.) Jepson eFlora, Revision 4, http://ucjeps.berkeley.edu/eflora/eflora_display.php?tid=18505, accessed on April 22, 2019. KR, NCoRO, CaRH, SNH, n SnFrB, Wrn, SNE (exc W&I); Markers link to CCH specimen records. Yellow markers indicate records that may provide evidence for eFlora range revision or may have georeferencing or identification issues. Purple markers indicate specimens collected from a garden, greenhouse, or other non-wild location.